'Essays on the Racial Realities of Our Nation and Our Time' is edited by Samuel Francis. The following review is by David Vincelette: "This should be required reading for US college students. The essays are written by distinguished race-realists who examine the subject from all points of view -- biological, psychological/mental, anthropological, sociological, legal, economic and demographic. 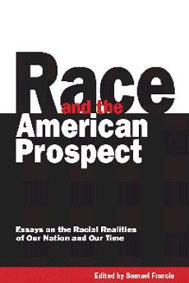 The reader unfamiliar with the subject or who has heard only egalitarian propaganda on race will be well-grounded on the subject of race and racial differences after having read this book."